Fresh off its first Colonial Athletic Association win since 2016, William and Mary hit the road to face Towson. Saturday, the College Tribe (2-4, 1-2 CAA) got off to a slow start, but took the lead into halftime after a strong effort by its defense. However, the Tigers (5-1, 3-0 CAA) reclaimed the lead in the second half as injuries and kicking struggles plagued the Tribe’s offense in a 29-13 setback. This was the Tribe’s first away game since its 51-0 thrashing at the hands of James Madison. 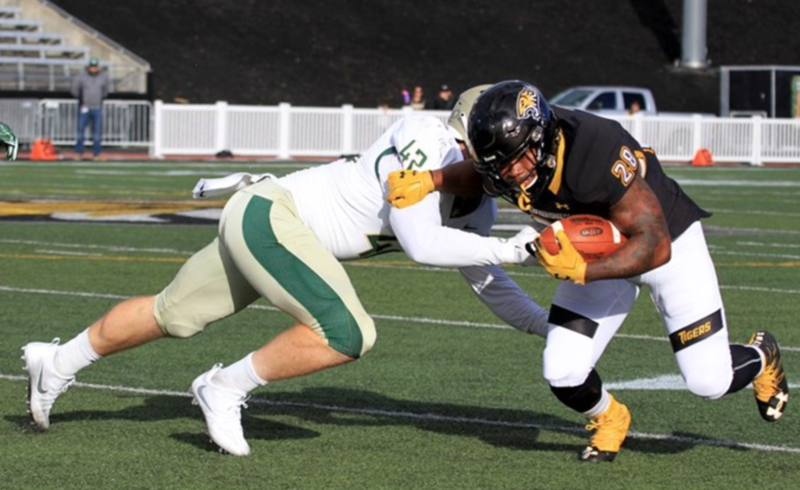 Last week, the College pulled off a fourth quarter comeback against Albany, who was also winless in conference play, but this week faced a stringent test at 17th-ranked Towson. The Tigers entered the contest on a three-game winning streak and undefeated against CAA opponents. Meanwhile, the Tribe was looking to pull off the upset and surge above .500 in the CAA for the first time since the 2015 season when it qualified for the Football Championship Subdivision playoffs after a 6-2 record in the conference. Saturday, the Tribe got the ball to open the game for the third-straight week, and sophomore quarterback Shon Mitchell and the College started its first drive on the 25-yard line. The College started strong with gains of eight and six yards on its first two plays from scrimmage, but a false start penalty set the Tribe back. It was forced to punt after just one first down. Will Michael launched a 38-yard punt with no return, setting the Tigers up at their own 27-yard line for their first crack at an offensive possession just over three minutes into the game. Running back Shane Simpson was instrumental to the Tigers’ success on their first drive. He reeled off a couple long runs, while quarterback Tom Flacco completed his first two passes of the game to bring the Tigers to the edge of the redzone at the Tribe’s 22-yard line. Similar to previous games, the College’s defense ratcheted up the intensity with the opposition threatening to score and sophomore defensive tackle Will Kiely tackled a scrambling Flacco for a loss on a key third down. The Tigers were forced into a field goal attempt and kicker Aidan O’Neill was unable to convert, keeping the game scoreless with 7:55 to go in the opening quarter. The College’s offense was unable to take advantage of O’Neill’s miss and went three-and-out, giving the Tigers good field position near midfield. Once again, they wasted no time moving the ball down field, but the Tribe was unable to come up with the necessary stops on this drive. The Tigers benefited from a 15-yard facemask penalty that put them inside the redzone and two plays later, running back Kobe Young scampered into the endzone on a two-yard scoring play. O’Neill split the goalposts on the extra point attempt to give the Tigers a 7-0 lead with just over four minutes to play in the first quarter. The scoring drive was five plays and only took 89 seconds. The Tribe once again failed to move the ball on offense and started with poor field position, so Michael’s 42-yard punt still set up the Tigers at the 37-yard line after a block-in-the-back call on the return. The Tigers moved into position to go up by two scores and settled for a field goal at the start of the second quarter, pushing their advantage to 10-0. The College shook off a slow start to work its way back into the game in the second quarter. The Tribe’s offense, playing without senior wide receiver DeVonte Dedmon who left with an injury on the first drive, struggled to move the ball once again on the first two possessions of the second quarter. A special teams play allowed the College to pull back within four points of the Tigers. After the Tigers started another drive with good field position, they manufactured an eight-play drive that led to a field goal attempt by O’Neill. However, junior defensive tackle Bill Murray blocked the kick and junior linebacker Arman Jones scooped up the loose ball and rumbled 71 yards for a scoop-and-score. Kicker Kris Hooper’s struggles continued as he missed the extra point, but Jones’ touchdown brought the Tribe to a four-point deficit, 10-6, with 6:24 to go in the first half. The College’s defense continued to hand its offense opportunities to get back in the game, coming up with another stop of the Tigers’ offense that had been averaging just under 40 points per game in their first five games. This time, the Tribe picked up a few first downs and moved down to the Tigers’ 22-yard line, before facing a fourth down and one. Laycock rolled the dice and went for it rather than kicking a field goal; Mitchell rushed for a first down, extending the drive. Junior running back Albert Funderburke ultimately capped off the drive with a go-ahead one-yard rush to put the Tribe up in the waning seconds of the opening half. The 15-play scoring drive encompassed 75 yards. Redshirt freshman kicker Jake Johnston came on in place of Hooper and nailed the extra point to give the Tribe a 13-10 lead going to the locker room. The Tigers received the second-half kickoff, but the Tribe’s defense locked them down and them to put after only one first down. However, the College’s offense was unable to carry over any momentum from its long touchdown drive at the end of the second quarter. The Tribe lost yards on the drive and Michael’s punt yielded a long return by Simpson, setting up the Tigers in opponent’s territory. Four running plays provided two-thirds of the yards on the Tigers’ drive and they scored with just over nine minutes remaining in the third quarter to regain the lead, 17-13. Another drive with negative yards after Mitchell was sacked twice allowed the Tigers to continue to dominate the field position. But a 46-yard punt from Michael helped to give the College’s defense a little breathing room as the Tigers took over at their own 42-yard line with 7:12 to play in the quarter. The Tigers moved the ball quickly inside the 20-yard line, but faced a fourth down at the 15 with two yards to gain. Rather than electing to kick a field goal and take a seven-point lead, the Tigers risked a fourth-down attempt, but the College’s defense was up to the task and allowed the offense to take over at the 14-yard line. Sophomore quarterback Dean Rotger entered the game for the College after Mitchell had been banged up on the previous drive. Rotger led the College to a pair of first downs, allowing the Tribe to flip the field a little bit before Michael was called into action once again. His punt pinned the Tigers back at their own 25-yard line late in the third quarter. Similar to rest of the evening, the Tigers had no issues moving the ball into opponent territory as Flacco accounted for 44 of the 48 yards the Tigers gained before time ran out in the third quarter. At the start of the fourth quarter, the Tigers took advantage of a fatigued Tribe defense to cash in for their third touchdown of the day. The College blocked the extra point, but the Tigers still held a commanding 23-13 advantage early in the fourth quarter. The College orchestrated another long, methodical drive, this time led by Rotger. The 16-play drive covered 60 yards, but the Tribe failed to capitalize and pick up another touchdown. Instead, the College turned to its struggling kicking game for a Johnston field goal that would have brought the Tribe within one score of the Tigers with under eight minutes remaining in the game. However, the Tribe’s kicking woes continued and Johnston pushed the field goal wide left, essentially ending the College’s chance at another double-digit fourth quarter comeback. The Tigers added another touchdown and the Tribe had another long drive stall on fourth down, as Towson claimed a 29-13 win. The Tigers were led to a victory by Flacco’s 188 yards through the air and 109 yards on the ground. Simpson also had 114 total yards for the Tigers. The Tribe’s defense was the star in its loss to the Tigers, but on the offensive side, Rotger threw for 92 yards, Mitchell threw for 71 yards and Funderburke had 77 all-purpose yards and one touchdown. Arman Jones had the College’s other touchdown on the blocked field goal attempt. The Tribe will look to recover from the loss when it returns home for a game against Maine on homecoming weekend. The game against the Black Bears will mark the midpoint of the College’s CAA schedule. The College may have to play without the services of Mitchell and Dedmon after their injuries during Saturday’s game.